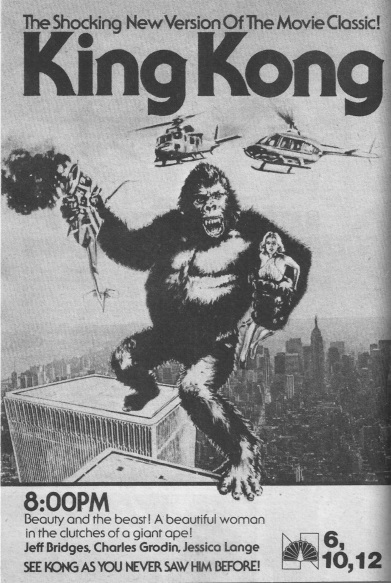 John Guillermin's version of KING KONG received it's first television airing in an extended cut in 1978. 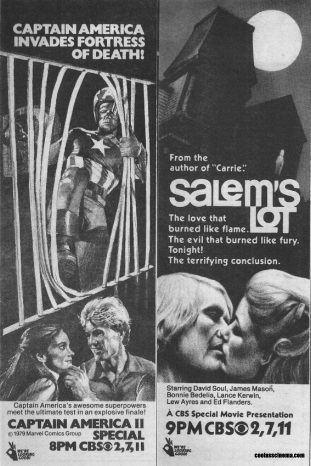 This ad from that extended version (thus far only ever seen on television in this country) contained over an hours worth of footage not in the theatrical release. This repeat event was spread out over two two hour time slots beginning on Thursday May 8th, 1980 and Friday May 9th, 1980. Notice how the artwork is different, yet it mimics the theatrical poster. On the same Thursday night at 10pm, a TV movie entitled THE CURSE OF KING TUT'S TOMB (1980) debuted on NBC. An hour of it aired that night, and the second hour aired the following Friday night at 10pm. Now that's a lineup! 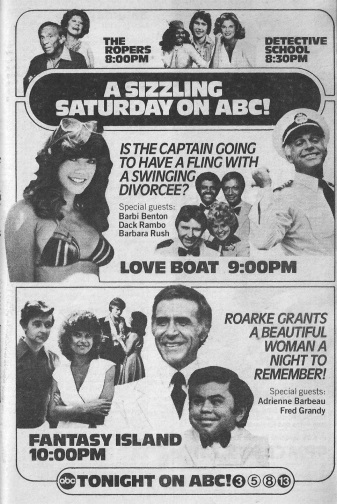 I vividly remember watching Love Boat and Fantasy Island many times on ABC. My mom was really into those shows, so I ended up watching along, too. 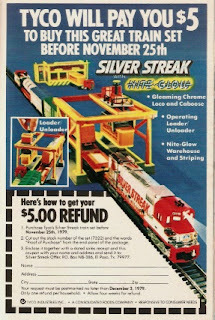 I had a couple different train sets, although I don't recall one of them being this one. Train sets were cool toys to have back in the day. These were originally two separate ads, I just combined them together. Both played on the same night an hours apart from one another. Also airing on this night (Saturday November 24th, 1979) at 11:30pm are FRANKENSTEIN MUST BE DESTROYED (1969) on Virginia's channel 7 and THE MUMMY (1959) on ABC channel 8. At 12:30am REVENGE OF THE CREATURE (1955) was aired on channel 5. 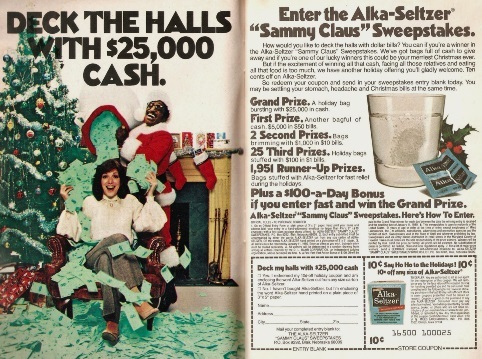 "The Candy Man", Sammy Davis Jr. was part of an Alka Seltzer campaign in 1979. Sammy Claus knows whose been naughty, nice, has upset stomach, heartburn and acid indigestion. 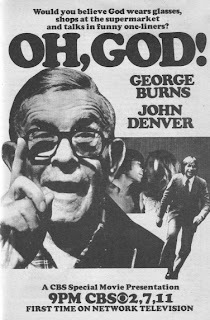 This was the network television premiere of OH, GOD! 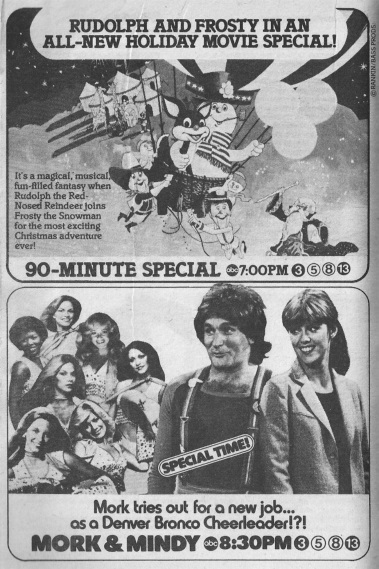 (1977) on Sunday night November 25th, 1979. On the same night of OH, GOD! 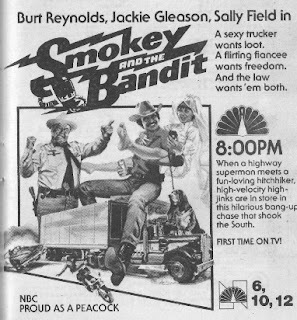 's CBS debut, NBC had the network premiere of SMOKEY AND THE BANDIT (1977). ABC had a TV movie premiere entitled WHEN SHE WAS BAD starring Cheryl Ladd and Robert Urich. 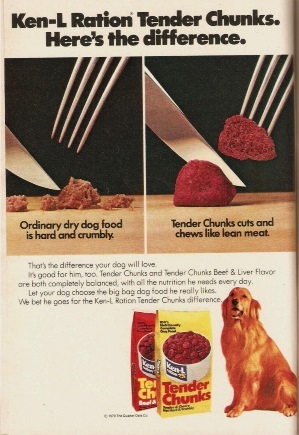 Do you remember Tender Chunks? This was a popular 80s dog food brand. 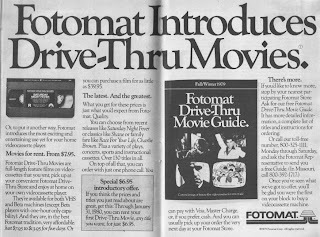 I have idea if it's still made anywhere, but the commercials were often seen on television throughout the 1980s. 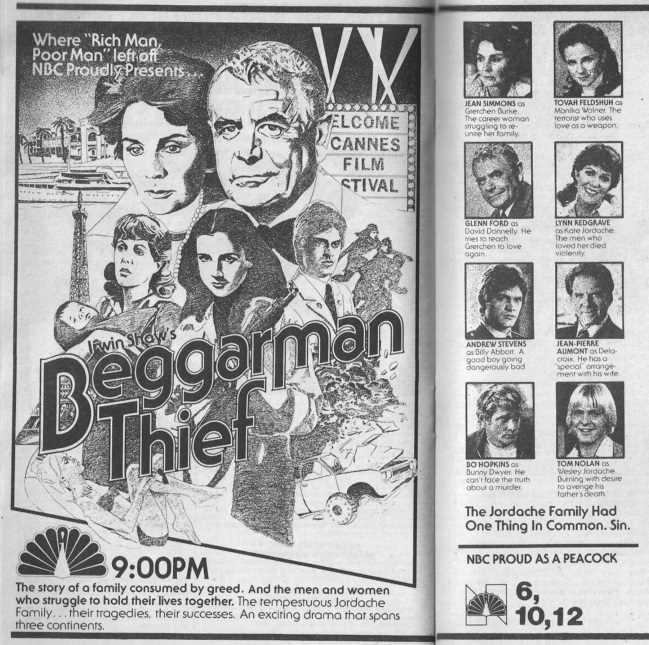 Beggarman, Thief was the sequel novel to Irwin Shaw's popular book Rich Man, Poor Man -- which was turned into a television ratings smash success in 1976. It did so well, the network wanted a sequel series to debut the following year, but Shaw had only an outline of his Beggarman, Thief story. Instead, a direct sequel entitled RICH MAN, POOR MAN BOOK II was put into production instead. BEGGARMAN, THIEF, when it was finally ready for television adaptation, picked up and ran with details not covered in either of the RM, PM series's. It wasn't intended to have been a series, but the two part, four hour movie aired November 26th and 27th, 1979. 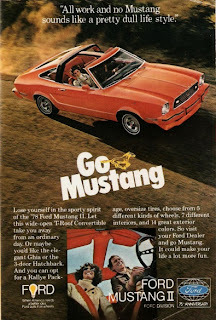 Apparently it wasn't as successful as its two predecessors. 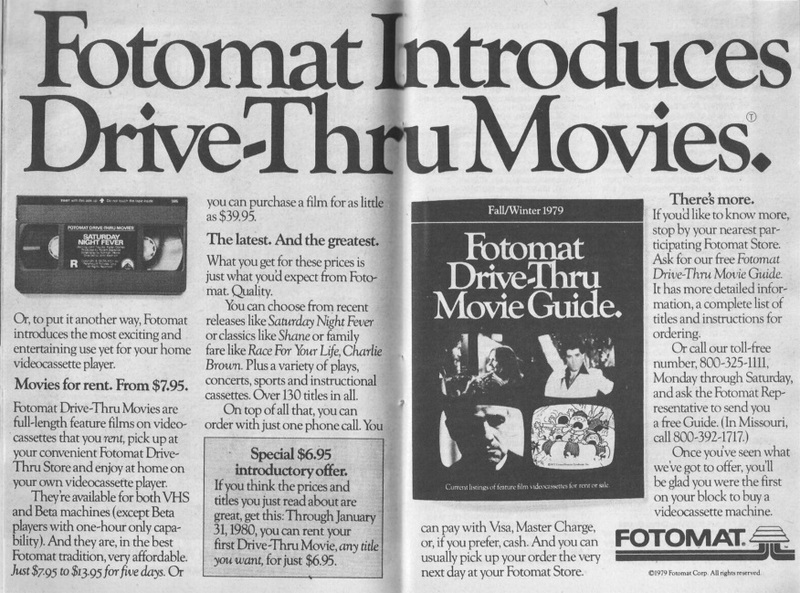 This is a 1979 TV Guide ad for Fotomat, one of those photo development kiosks that branched out into videocassette rentals before the big video store boom of the early 80s. You can read more about this service in the ad above. Above is a brief piece and behind the scenes photos on an upcoming CBS kids show entitled SPACE ACADEMY; a show some of you might remember. 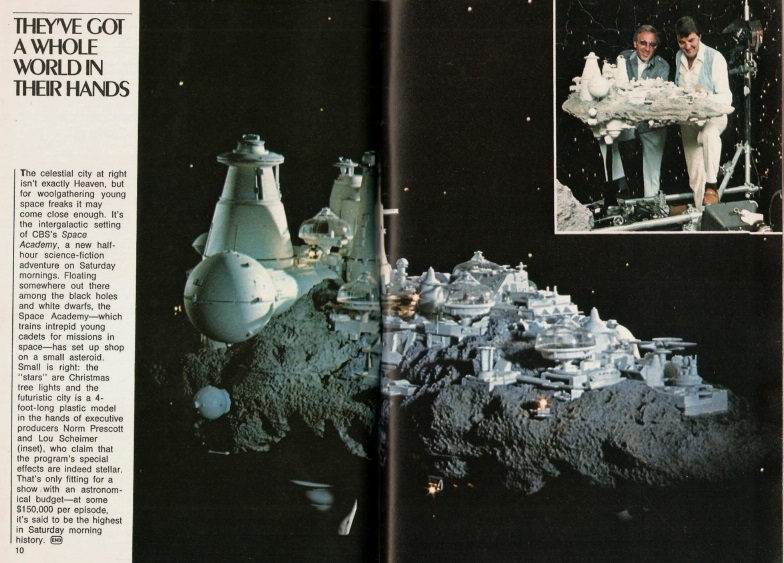 This three hour Irwin Allen television production made its premiere May 7th, 1980. This thriller had an all-star cast and ended up being the last completed production of its star, Natalie Wood. 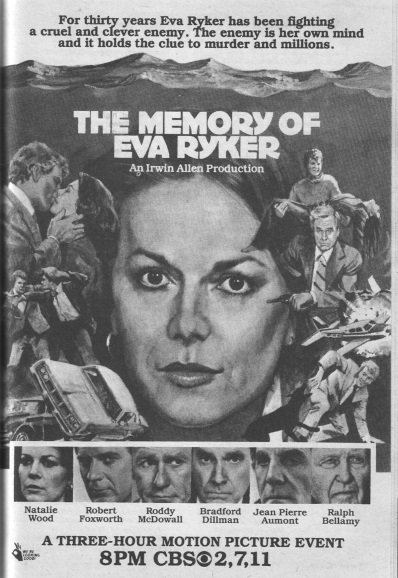 Am I the only one that misses network televisions miniseries, and Movie Of The Week? 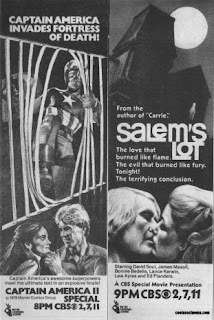 Salem's Lot,Dark Night Of The Scarecrow, The Dark Secret Of Harvest Home,Shogun,Rich Man, Poor Man, Crowhaven Farm, Death Scream...There's nothing like them anymore. I miss them, too, Bob. That sort of thing seems to have been replaced by "reality" TV now. Some of those you listed have their ads included in this column, too.